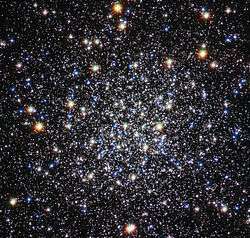 Messier 12 or M 12 (also designated NGC 6218) is a globular cluster in the constellation of Ophiuchus. It was discovered by the French astronomer Charles Messier on May 30, 1764, who described it as a "nebula without stars". In dark conditions this cluster can be faintly seen with a pair of binoculars. Resolving the stellar components requires a telescope with an aperture of 8 in (20 cm) or greater. In a 10 in (25 cm) scope, the granular core shows a diameter of 3′ (arcminutes) surrounded by a 10′ halo of stars. Located roughly 3° in the sky from the cluster M10 and 5.6° from the star Lambda Ophiuchi, M12 is about 15,700 light-years (4,800 parsecs) from Earth and has a spatial diameter of about 75 light-years. The brightest stars of M12 are of 12th magnitude. With a Shapley-Sawyer rating of IX, it is rather loosely packed for a globular and was once thought to be a tightly concentrated open cluster. Thirteen variable stars have been recorded in this cluster. M12 is approaching us at a velocity of 16 km/s. A study published in 2006 concluded that this cluster has an unusually low number of low mass stars. The authors surmise that they were stripped from the cluster by the gravitational influence of the Milky Way. Map showing the location of M12. Credit: Roberto Mura. 1 2 Shapley, Harlow; Sawyer, Helen B. (August 1927), "A Classification of Globular Clusters", Harvard College Observatory Bulletin (849): 11–14, Bibcode:1927BHarO.849...11S. 1 2 Goldsbury, Ryan; et al. (December 2010), "The ACS Survey of Galactic Globular Clusters. X. New Determinations of Centers for 65 Clusters", The Astronomical Journal, 140 (6): 1830–1837, arXiv:1008.2755 , Bibcode:2010AJ....140.1830G, doi:10.1088/0004-6256/140/6/1830. 1 2 Boyles, J.; et al. (November 2011), "Young Radio Pulsars in Galactic Globular Clusters", The Astrophysical Journal, 742 (1): 51, arXiv:1108.4402 , Bibcode:2011ApJ...742...51B, doi:10.1088/0004-637X/742/1/51. 1 2 "SIMBAD Astronomical Database", Results for NGC 6218, retrieved 2006-11-15. ↑ Marks, Michael; Kroupa, Pavel (August 2010), "Initial conditions for globular clusters and assembly of the old globular cluster population of the Milky Way", Monthly Notices of the Royal Astronomical Society, 406 (3): 2000–2012, arXiv:1004.2255 , Bibcode:2010MNRAS.406.2000M, doi:10.1111/j.1365-2966.2010.16813.x. Mass is from MPD on Table 1. 1 2 Forbes, Duncan A.; Bridges, Terry (May 2010), "Accreted versus in situ Milky Way globular clusters", Monthly Notices of the Royal Astronomical Society, 404 (3): 1203–1214, arXiv:1001.4289 , Bibcode:2010MNRAS.404.1203F, doi:10.1111/j.1365-2966.2010.16373.x. 1 2 Thompson, Robert Bruce; Thompson, Barbara Fritchman (2007), Illustrated guide to astronomical wonders, DIY science O'Reilly Series, O'Reilly Media, Inc., p. 137, ISBN 0596526857. 1 2 Monks, Neale (2010), Go-To Telescopes Under Suburban Skies, Patrick Moore's Practical Astronomy Series, Springer, p. 118, ISBN 1441968504. ↑ "Messier 12: Gumball Globular | Messier Objects". www.messier-objects.com. Retrieved 2015-08-17. ↑ How to Steal a Million Stars?, ESO, February 7, 2006. Wikimedia Commons has media related to Messier 12.